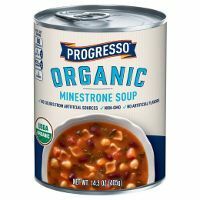 New Progresso Organic Minestrone Soup. Make it Progresso. No artificial colors, flavors, preservatives. Non-GMO. Certified USDA organic.